Frequently listed as the greatest film ever made, Orson Welles's masterpiece is also a thinly veiled biopic of William Randolph Hearst. Stars: Orson Welles, Joseph Cotten, Agnes Moorehead, Dorothy Comingore, Ruth Warrick, Everett Sloane, George Coulouris, Ray Collins. Everyone recognized Orson Welles’s Charles Foster Kane as a thinly veiled version of William Randolph Hearst, but who or what was “rosebud”? Citizen Kane has probably had more advance publicity of one kind or another than any other picture yet produced. Practically everybody connected with the production has been reported on the verge of a lawsuit. Some have said that all this uproar was nothing but exceptionally well-handled publicity, while others have sworn that William Randolph Hearst was determined to prevent the picture’s release. Finally it was announced that the picture would definitely be released in the near future, and the press assembled at last week’s preview in a state of great expectancy. Many would probably have rejoiced to find producer, director, actor, and part-author Orson Welles’s ambitious first effort in Hollywood not an unqualified success: after all, the man had had no previous cinema experience, and if reports were true he had walked into the studio and produced on a very low budget a film which was a masterpiece. It must be stated here that no amount of advance publicity or ballyhoo could possibly ruin the effect of this remarkable picture. It is probably the most original, exciting, and entertaining picture that has yet been produced in this country, and although it may lack their subtlety it can certainly be placed in the same bracket as the very best pre-war French productions. The film may not have been inspired by the life of William Randolph Hearst, but the story of Charles Foster Kane, as unfolded in the picture, certainly bears a remarkable resemblance to Hearst’s career. The incident concerning the Spanish-American War, the vast collection of useless antiques acquired by Kane, and certain details such as the picnic, with the guests compelled to spend the night under canvas, are familiar parts of the Hearst legend; and the castle of Xanadu, Kane’s retreat from the world, with its endless acres and private zoo, is more than reminiscent of San Simeon. If Mr. Hearst decides, as many others undoubtedly will, that the film is only the most thinly disguised version of his life story, he will perhaps be favorably impressed with the sympathy and understanding with which the subject has been treated, and may even be delighted to have provided material for a drama of almost classical proportions. The film opens with the death of Kane, a very old man, alone in the colossal, ugly monument to his wealth and power–Xanadu. A sort of March of Time dealing with Kane’s life is then presented. The producers of this short are dissatisfied, finding it too superficial and impersonal, and are determined to obtain more intimate details of the man’s personal history. The remainder of the picture deals with the information on Kane’s life and character obtained respectively from his guardian, his chief assistant, a dramatic critic who was once his best friend, his second wife, and his butler. This technique of unfolding the story necessitates five separate flashbacks and creates a certain amount of confusion which is more than compensated for by the powerful effect obtained by the gradual illumination of character, until with the click of the final switch he is fully revealed – empty, lonely, and unhappy, a victim of his own personal power. This excellent cinematic material Welles has embellished with brilliant directorial, pictorial, and dramatic touches. He breaks, with the greatest effect, practically every photographic rule in the business, employing very few close-ups, playing whole scenes with the faces of the performers in shadow, using lighting to enhance the dramatic value of the scene rather than the personal appearance of the actor. He is, in fact, one of the first Hollywood directors really to exploit the screen as a medium, and it is interesting to note that in doing this he has used an entire cast with no previous screen experience. The acting both of Welles and of the rest of the Mercury Theater cast is excellent. Dorothy Comingore as Kane’s second wife, whom he forces to sing in opera to gratify his ego, is particularly effective; so is Joseph Cotten as the dramatic critic. 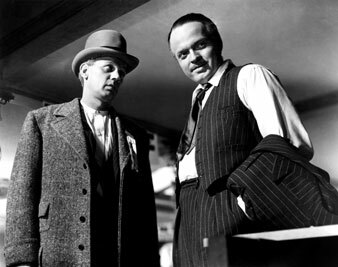 Welles himself gives an amazing performance as Kane, equally convincing in youth, middle age, and senility. The photographer, Gregg Toland, has achieved some wonderful effects, particularly the scene in the projection room of the newsreel company. The picture has made a tremendous impression in Hollywood. Charlie Chaplin is reported to be prepared to back any venture that Welles may have in mind. Perhaps when the uproar has died down it will be discovered that the film is not quite so good as it is considered now, but nevertheless Hollywood will for a long time be in debt to Mr. Welles.